Looking for something unique and fun to do with your Mother or Grandmother this Mother’s Day? Why not take the ladies on a nostalgic trip back in time and enjoy bonding together over craft, music and afternoon tea? At Pixie Paper, we will be doing exactly that! In our beautiful studio, we will be putting on the old-time tunes, enjoying tea and scones and hand decorating our own A4 Art Journal. 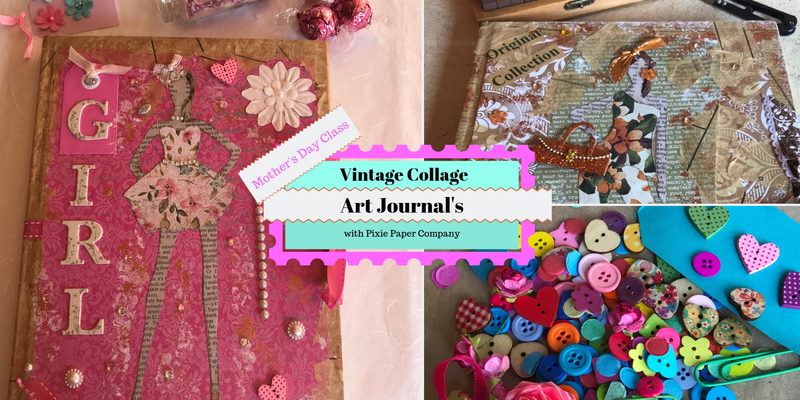 We will be using vintage sewing patterns, stamps, ribbons, sparkles, buttons and paints to create a nostalgic journal you can fill with artwork, recipes or anything else that takes your fancy. These techniques can be applied to other stationery items, which can make great gift ideas as well as giving you a creative fix anytime. How to use stencils and mixed media to make your journal arty.